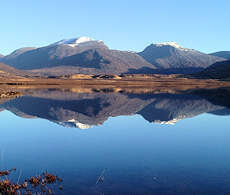 Beinn Dearg and Cona' Mheall dominate the scenery when driving north across the Dirrie More towards Ullapool. 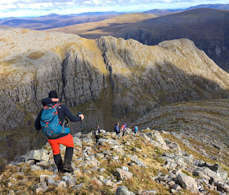 A circuit of the corrie skyline, taking in the two Munro summits, provides an engrossing and challenging route with some easy rock-scrambling on the way. A day of hiking and scrambling up high mountains in the North-West Highlands. 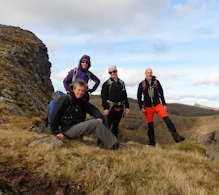 Enjoy superb, yet easy rock-scrambling up the south spur of Cona Mheall. 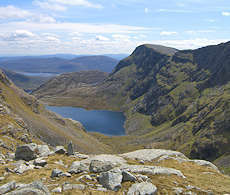 Bag the two Munros of Beinn Dearg and Cona' Mheall, with the option of extending the route to include nearby Meall nan Ceapraichean. 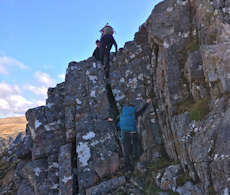 Rock-scrambling to Grade 1, moderate day. 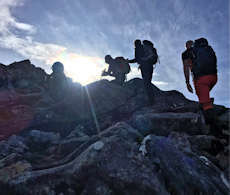 This event is a guided hill-hiking and rock-scrambling day up Beinn Dearg and Cona' Mheall with one of our experienced and qualified leaders. Your guide will know the mountains and routes well and will also be able to give you insight into the flora, fauna and geology. The approach for our day is on a little used stalkers track from Loch Droma, climbing to a saddle before descending to cross the Allt a'Gharbhrain which often entails boots off to remain dry ! The route ahead is incredibly wild and majestic, initially climbing towards the Princess Corrie before rising above Coire Ghranda to scramble up through broken crags and steep grass onto Cona Mheall's south-east ridge. From here the 450m cliffs surrounding Coire Ghranndha are spectacular, the ridge ahead is narrow and slabby, providing easy and entertaining scrambling. The summit is a fine viewpoint to appreciate the vastness of the North-West Highlands, and a good place to stop for lunch ! Ahead the route gives views down to the corrie loch before following the line of an impressive dry stone wall towards the summit dome of Beinn Dearg. 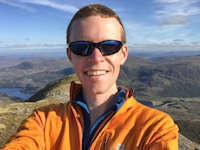 We have various options for return depending on group desire and conditions, perhaps taking in the Munro summit of Meall nan Ceapraichean on the way. Our route is over grass and heather clad slopes leading to rocky and bouldery terrain higher up. The route takes in some rock-scrambling up to Grade 1 though none of this is overly exposed. You'll need your general hiking and hill-walking gear appropriate to the conditions and time of year. You'll not need any climbing gear and your guide will have a rope for confidence. Leading the event on 17 May 2019. Ullapool makes a great base for this day, being ideally located and having pubs, restaurants and shops. There is a good bus service from Inverness to Ullapool (see this page for more info).